When a loved one has allergies, and especially eczema, taking care of their skin and eliminating the triggers is very important. However, there are factors other than diet and skin care to consider. For instance, many children with eczema eventually develop asthma. My son never has, and I don’t think he ever will (I’m keeping my fingers crossed), but still, I have taken many precautions to take care of the air he breathes. There are many things you can do to improve the air quality in your home. One of the most basic is to open the windows. Of course, this is not always as easy as it seems. Sometimes pollution or pollen levels are so high that it is better to keep them shut. If you have a forced air system like we have, you might want to keep the windows closed in winter to keep the house warm–or if you live in a humid climate like we did in south Texas, you might want to keep them closed in the summer to keep the humidity out while you run the air conditioner! The problem is that indoor air quality can get worse than outdoor air quality. There are a number of factors that contribute to the decline of indoor air quality. One is definitely the cleaners and other chemicals many use in your home. Air fresheners, toxic chemical cleaners, and even the foam in your sofa, can fill the air with toxins that reduce air quality. Oxygen become depleted, making one more drowsy. Positive ions build up in the air, causing free radical damage in the body. 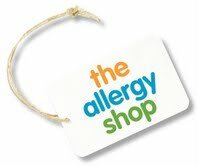 All of these factors are things everyone should consider, whether they have allergies or not. Those who have allergies, however, would do well to be especially diligent about the quality of the air in their home. The reason is that the body is busy dealing with the allergens it is exposed to, and reducing exposure to as many as possible can help the body deal better with the ones it can’t avoid. For instance, my son has both food and environmental allergies. We once visited a home with a dog and spent several hours there. 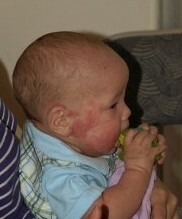 When we left, he was experiencing a flair-up of eczema, especially on his face. A year later we spent several days in this home, and hardly had any problems at all–in fact, it was during this time that we quit using prescription steroid cream. In the first case, he was still being exposed to many allergens through my breastmilk, whereas we had eliminated all of the major and many of the minor allergens later, and so his body was able to deal with the exposure to the dog dander better. My mother finds that she can deal with her environmental allergies better if she avoids wheat during the pollen season. So what can you do to improve your air quality? Besides eliminating as many toxins as possible from your home and opening the windows as often as possible, you can invest in a good quality air purifier. 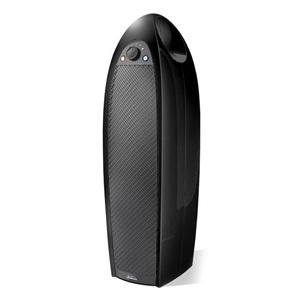 Jarden Consumer Services offered to allow me to try one of their air filters, and I was very pleased to get the Holmes® HAP9424B-TUS Medium Room Air Purifier, along with 4 extra allergy-removal aer1 ™ filters (this purifier uses two filters at a time). I really like the purifier’s sleek design. It doesn’t look out of place, and is much nicer than many older air purifiers. Being tall and narrow like it is, it is easy to fit into just about any room. The fan has 3 speeds to choose from. It tends to blow a bit, especially on the higher settings, but it’s not heavy and easy to turn it in a different direction if one doesn’t want to be in the draft. The noise is a little more than some purifiers, perhaps, about like a low fan, but it is not annoying, nor does it make other sounds difficult to hear. One feature I like is the ion button, which makes the machine emit negative ions. These counteract the bad positive ions and make the air much more like outdoor air. This can be turned on and off, because, as the manual said, leaving it on all the time can cause excess dust to collect on surfaces. It also has a light that will flash when it is time to replace the filter. The fan is designed to run 24/7, all year long, unlike the fan in the bathroom, for instance, which could catch fire if left on too long. I did not notice any improvement in my son’s condition with this air purifier; however, as I mentioned already, he does not have asthma or any lung problems, so I was not surprised at this. I have no doubt that it has improved our quality of life in ways that we are not necessarily sensitive to. Sometimes we have it out in the living room, so that the whole family can benefit. Other times we will put it in my son’s room–especially at night–so that he can get the full benefit of better air. If you are interested in getting this or another purifier like it, as well as replacement filters, you can visit the Aer1 Systems site, or check with major retailers like Wal-Mart or Target. This entry was posted on Thursday, January 26th, 2012 at 6:56 pm	and is filed under Product Reviews, Research. You can follow any responses to this entry through the RSS 2.0 feed. You can leave a response, or trackback from your own site.